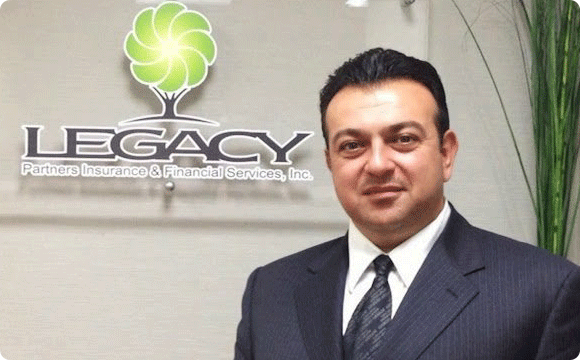 About Legacy Partners Insurance & Financial Services, Inc.
Legacy Partners Insurance & Financial Services Inc. has grown in financial strength and reputation by providing life and health insurance coverage to thousands of families across the State of California. The secret behind the success has always been company’s partnership with highest rated carriers who have at least 100 year history behind them. Our stringent code of ethics places the client’s needs above all others and demands uncompromising integrity in every aspect of our business conduct. We design programs to help you achieve financial security in a complex and constantly changing world. Legacy Partner’s mission is to provide thorough audit of prospective client’s present financial situation, understand what clients’ objectives are for themselves, their families or their business, then design a program specifically for them so clients can achieve financial security in this complex and constantly changing world. This is what makes us a growing leader in the insurance industry. Our goal is to help you achieve your financial objective. We pledge our knowledge, resources and dedication to integrity in all we do. Paul Arakelyan, has been hosting weekly Live TV Shows named “Insurance Forum” through local media over the past 14 years. He has branded his name so that when people hear Arakelyan they associate it with life insurance agency. Over the years, Legacy Partners have insured thousands of individuals and sold millions of dollars of insurance and other financial products due to high professionalism, honesty and integrity. Paul Arakelyan has worked with highly rated carriers. Arakelyan was Regional Vice president for North Coast Life Insurance Company for California, headquartered at Spokane, Washington. He has been working with Kansas City Life Insurance Company, Mass Mutual Life, New England Financial/Met Life, Mutual of Omaha, Transamerica, Guardian Life Insurance Company, Blue Shield/Blue Cross of California, Anthem, Cigna and many others. He is a General Agent for Kansas City Life Insurance Company for California. Over the years Paul Arakelyan has supported many local for-profit and non-profit organizations, political figures, veterans, etc. He was a Board of Director for Red Cross (Glendale CA Division) and Komitas International School of Music (non-profit organization). He made donations to hospitals in US and in Armenia. He helped many veterans to cope with their wounds from war of Nagorno-Karabakh, Region in Armenia. He has helped many singers, musicians, writers by sponsoring concerts, albums and books, due to his love and passion for music and art.